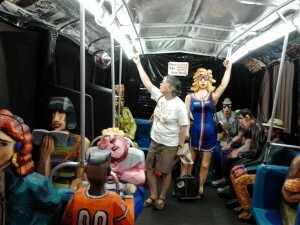 You are here: Home > Come sit on the bus – Red Grooms’ bus! Step on board the Red Grooms‘ bus.! I should really fine myself one large summer ice cream cone this week for having taken so long to get to the Brattleboro Museum and Art Center! I only reside a short half hour away and that doesn’t even count the number of times I’ve been across the street grocery shopping! But, leave it to me, I am duly chastised! But what do you want to know about this amazingly delightful museum? Their mission statement includes the words inspire, educate and engage. And, if their previous exhibitions were as amazing as the current Red Grooms exhibit, then they do a great job of fulfilling their mission. As an absolutely lover of all things art, and an early childhood educator, where else can you have the opportunity to sit in the middle of a piece of art? The current Red Grooms exhibit invites you to board the bus, stand and hold a hand loop or sit next to a life-size creation. When I visited there were a number of families, and the conversation was nothing less than exquisite. 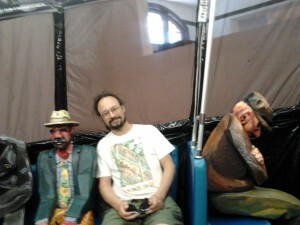 I first loved Red Grooms when I was visiting Nashville and came across his carousel on a visit to Nashville. What a delightful piece of work! We saw his work at a few other museums, and finally this show had me showing up at this lovely museum. It’s really a perfect way to spend an hour or so; whether you’re with a lover, your gramma, or a pack of children, or all of the above. The current exhibits, besides Red Groom’s which has a piece outside, and then fills the main area (there is a bus!) includes “Dynamic Invention: American Abstract Artists at 75,” “Between Dark and Night: New Pastels by Mallory Lake,” and a very cool “Your space/color” exhibit. This last one is hands on with materials to work and play with color. All of the galleries are on the small side, and so invite you to spend a little or a lot of time depending upon your interest. The entire museum is just right for families wanting to introduce their children to the world of fine art. The building itself is an old train station with all the character you would expect. There are as well a couple of sculptures out in front of the building. By the way, take the website advice seriously to call ahead and check that they are open. I actually was going to go there a few days sooner than I did, I called, and in fact the museum was going to be closed at 1 pm for a private event. So do check!